Hot on the heels of their first two Geostationary Transfer Orbit (GTO) missions, SpaceX have been awarded the launch contract for the mission to loft the JCSAT-14 communications satellite to its GTO destination. The award from SKY Perfect JSAT Corporation of Japan calls for the satellite to ride uphill on a Falcon 9 v1.1 rocket in the second half of 2015. SpaceX successfully proved they were able to provide rides to GTO via the two recent missions involving their Falcon 9 v1.1, which launched just a month apart. With the newly upgraded Falcon 9 v1.1 debuting last year with the CASSIOPE mission, SpaceX evolved their mission profile to take the next leap into space, involving two burns of their Merlin VacD-driven Upper Stage. Although this was not required for the CASSIOPE mission, a troublesome test involving the re-start of the stage provided SpaceX engineers with important data, ultimately resulting in additional hardware being installed on the stage, providing mitigation against the fuel lines becoming frozen when operating in space. These improvements proved to be successful, as the Falcon 9 v1.1 launched for a second time, this time debuting from her SLC-40 launch site in Florida. The Upper Stage fired, coasted and then importantly re-started, sending the SES-8 satellite on its way to its Geostationary destination. Showing their ability to recycle for another launch within a short period of time, SpaceX then launched their third Falcon 9 v1.1 this week, lofting the Thaicom-6 satellite into GTO. Once again the launch was conducted without issue. 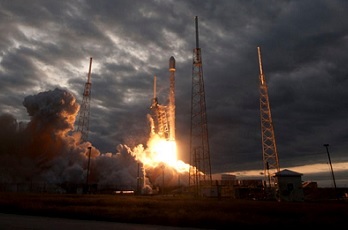 The company is already deep into preparations for their next launch, again from SLC-40 at Cape Canaveral, this time involving their Dragon spacecraft’s first ride on the upgraded Falcon 9, en route for her fourth trip to the International Space Station (ISS) on the latest Commercial Resupply Services (CRS) mission. With the SpX-3/CRS-3 mission currently targeting February 22, SpaceX are well on their way to a record year in 2014. The company’s manifest is already expanding in the years to follow, with another launch contract announced on Friday. Awarded by SKY Perfect JSAT Corporation of Japan, SpaceX have been hired to loft the JCSAT-14 communications satellite into a Geostationary Transfer Orbit (GTO). JCSAT-14 is a Space Systems/Loral (SSL) telecommunications satellite that will succeed and replace JCSAT-2A, providing coverage to Asia, Russia, Oceania and the Pacific Islands. With 26 optimized C-band transponders and 18 Ku-Band transponders, the satellite will extend JCSAT-2A’s geographical footprint and address fast-growing mobility markets across the Asia-Pacific region. 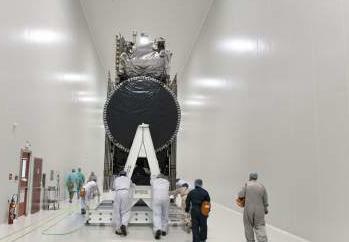 Notably, the previous satellite in this family – JCSAT-13 – was lofted into space from the European Spaceport in Kourou, French Guiana by an Ariane 5 ECA in May, 2012. The bird was sharing the ride uphill with the VINASAT-2 satellite. Previous JCSAT launches have also been conducted by Arianespace, such as JCSAT-10 and JSCAT-12, while JCSAT-11 was lost during a failed Proton-M launch conducted by International Launch Services (ILS). 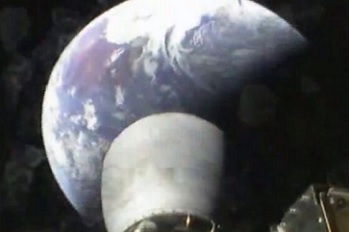 SKY Perfect JSAT Corporation of Japan currently have a fleet of eight satellites in space.